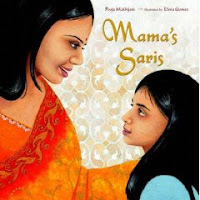 Mama's Saris by Pooja Makhijani; illustrated by Elena Gomez. Copy supplied by author. Picture book. A little girl wants to wear her mother's dress-up clothes. After all, she is grown up -- she's seven! And she's having a party -- so why not dress up in one of her mother's saris? As the girl helps her mother pick out which one of the special saris to wear that day, she holds out hope that Mama will say yes, she can dress up. I enjoyed that this is a story that is both unique (the saris, with details such as "The folds and nooks of Nanima's saris hold lots of secrets. I always find coins tied into the ends of safety pins fastened on the inside, and I smell the scent of cardamom and sandalwood soap all over"); yet universal (a child wanting to dress up in her mother's clothes). I like the mother/daughter (and mother/daughter/grandmother) interaction in the book (which is why, yes, I'm actually organized enough to post this on Mother's Day!)*. In part because the narrator is older (7), and also the cultural information found within the text, this would work well as a read aloud for older kids.